The summer of peach desserts continues. I made this one twice. The first one was all-around disastrous. I had to roll out the pastry dough twice because the first time I wasn’t able to form it without breaking it. After it came out of the oven, it slipped off the cooling rack and right onto my kitchen table. It was still tasty, but I had much better luck with the second one. This tart looks pretty impressive and doesn’t require a tart tin. I made mine with peaches (unpeeled) and blackberries. 1. Note: The amount of water that the dough will require depends on the ambient humidity; in a dry environment, it may need more water, in a humid environment, less. The dough can be made ahead and refrigerated overnight or tightly wrapped in two sheets of plastic wrap and frozen for up to one week. If at any point the dough becomes soft, sticky, and dificult to work with during rolling, chill it until it becomes workable. 2. For the dough: In food processor, pulse flour and salt to combine, about three 1-second pulses. Scatter butter pieces over flour, then pulse until texture resembles coarse bread crumbs and butter pieces about the size of small peas remain, ten to twelve 1-second pulses. Sprinkle 1 tablespoon water over mixture and process 1 second; repeat until dough begins to form small curds and holds together when pinched with fingers. Empty dough onto work surface; dough will be crumbly (if dough has large dry areas, sprinkle additional 2 teaspoons water over dry areas and incorporate by gently fluffing entire amount of dough with fingers). Using bench scraper, gather dough into rough mound about 12 inches long and 4 inches wide (mound should be perpendicular to edge of counter). Beginning from farthest end, use heel of a hand to smear about one sixth of dough against work surface away from you. Repeat until all dough has been worked. Using bench scraper, gather dough again and repeat. Dough should now be cohesive. Form dough into 4-inch disk, wrap in plastic, and refrigerate until cold and firm but malleable, about 1 hour. 3. For the filling: During last 30 minutes of chilling, prepare fruit. Halve and pit stone fruit and cut into 1/2-inch-thick wedges. Gently wash and dry berries. Combine fruit in medium bowl (you should have about 3 cups); set aside. Adjust oven rack to lower-middle position and heat oven to 400 degrees. 4. To assemble and bake: (If dough has chilled longer than 1 hour and is cold and hard, let stand at room temperature 15 to 20 minutes before proceeding.) On large sheet of parchment paper lightly dusted with flour, roll dough to 12-inch round about 3/16 inch thick, dusting with flour as needed. (If dough sticks to parchment, gently loosen and lift sticky area with bench scraper and dust parchment with additional flour.) Slide parchment and dough onto baking sheet and refrigerate until cool and firm yet pliant, 15 to 30 minutes (if refrigerated longer and dough is hard and brittle, let stand at room temperature until pliant). 5. Sprinkle fruit with sugar and toss gently to combine. Remove baking sheet with dough from refrigerator. Mound fruit in center of dough, leaving 2 1/2-inch border around edge. Carefully grasp one edge of dough and fold up outer 2 inches over fruit, leaving 1/2-inch area of dough just inside of fold free of fruit. Repeat around circumference of tart, overlapping dough every 2 to 3 inches; gently pinch pleated dough to secure, but do not press dough into fruit. Working quickly, brush dough with water and sprinkle evenly with 1 tablespoon sugar. 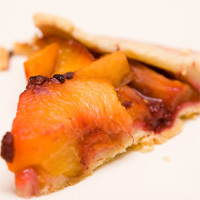 Bake until crust is deep golden brown and fruit is bubbling, 50 to 55 minutes. Cool tart on baking sheet on wire rack 10 minutes. Using offset or wide metal spatula, loosen tart from parchment and carefully slide tart off parchment onto wire rack; cool until warm, about 30 minutes, or to room temperature, about 1 hour. Cut into wedges and serve. someone is obsessed with peaches.